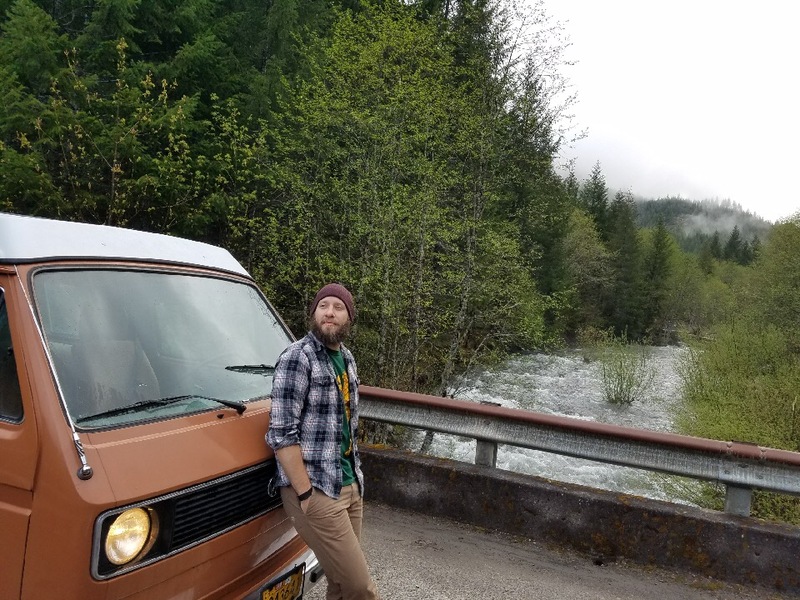 The Vanagon as of this time is unnamed. We haven’t found one that has stuck with us above all others. We’ve made a casual joke that maybe it’s like the Pacific Crest Trail, you get your name once you are out there. JC and I are not mechanical people. I would say we are educated and resourceful, but we are learning everything as we go. We have two giant books that we carry with us everywhere we go just in case. A big perk of old Volkswagen vehicles is that the Germans are highly organized and detailed. The manuals are so indepth I believe anyone could pick one up and, given enough time, solve the problem. (1) I have changed many flat tires in my day, specifically for Kia, Honda, and Toyota. (2) I know how to pop the hood and peer into the engine with one hand on my hip while the other strokes my beard in contemplation. I could never tell you specifically what it is I am looking at but dammit if I don’t look good while pretending. The vehicle is from 1981, parts are going to break down. For all I know there are some broken down parts in there that I haven’t discovered yet! 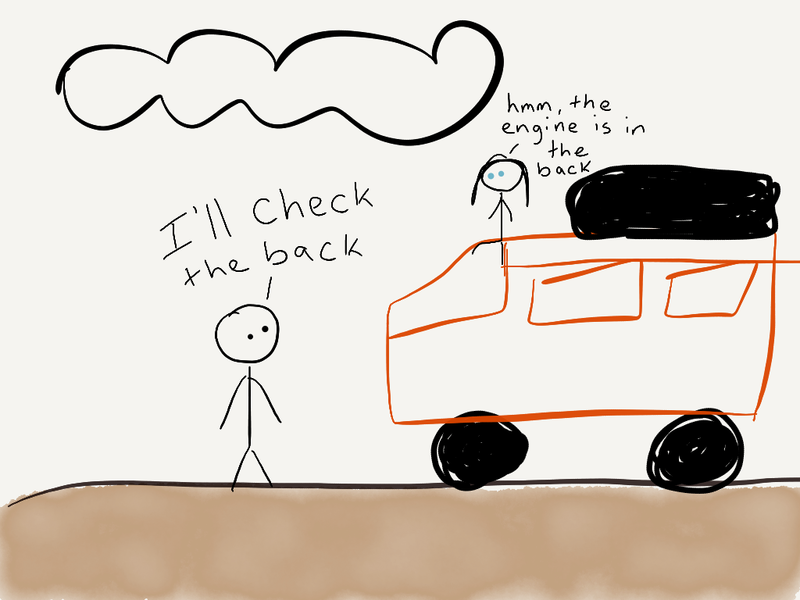 The engine on the Vanagon was rebuilt before we got it and our mechanic told us that the van looked good but the gas gauge on the vehicle doesn’t work and the gas tank leaks. I’d go ahead and call those big time problems if your intent is to live on the road. When dealing with repairs for this kind of vehicle you’re most likely looking at researching the problem, ordering the parts yourself, and then bringing it all back to your mechanic so they can make it work. That’s what we did. We talked to our local Volkswagen mechanic, great guys located at Young’s Volkswagen, and they dropped the tank, fixed our gas gauge, and resealed the tank. 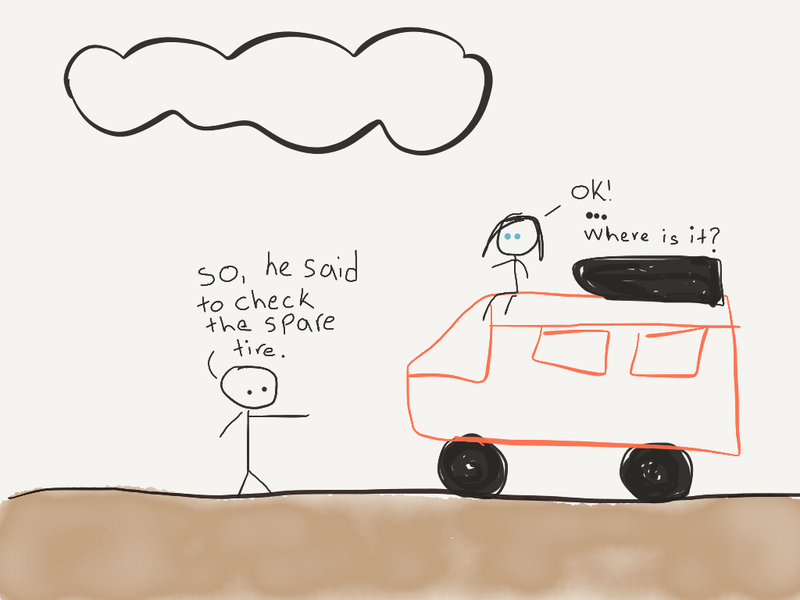 Karp: “Ah, yes, the spare tire. Of course. Thanks.” I said to him, and I nodded my head enthusiastically. In case you are wondering – doing anything enthusiastically does not make you an expert or impart any knowledge. I was feeling fairly accomplished. In a span of two days we had racks installed on the top and fixed all of our gas related problems. Spare tire, no problem, no need to ask any more questions about that. JC and I drove home where the following conversation ensued. So, if you have any wisdom to share with us apprentice Vanagoners please comment below! Would love to reach out, learn some new information, and share stories!